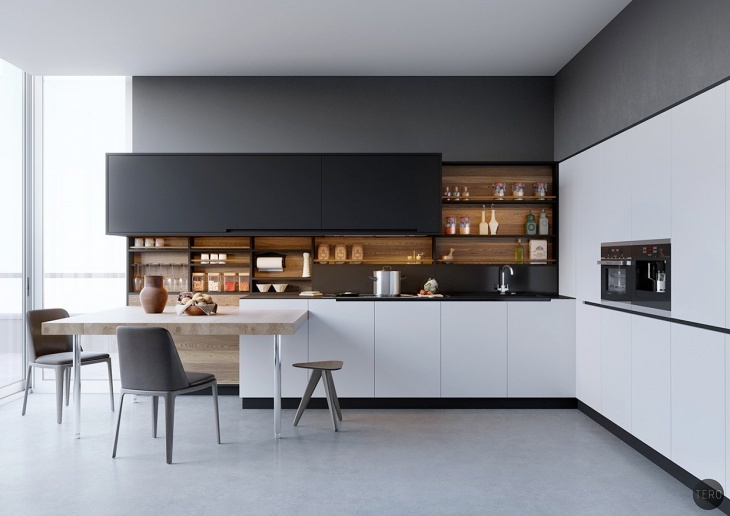 A monochrome kitchen is a space with a simple color scheme in design. Monochrome is basically the use of black and white combination or a single color in varying shades against a background in neutral shade. This concept is ideal for both indoor and outdoor kitchens. Some people choose the black and white combination. Other options can be seen in the images below. 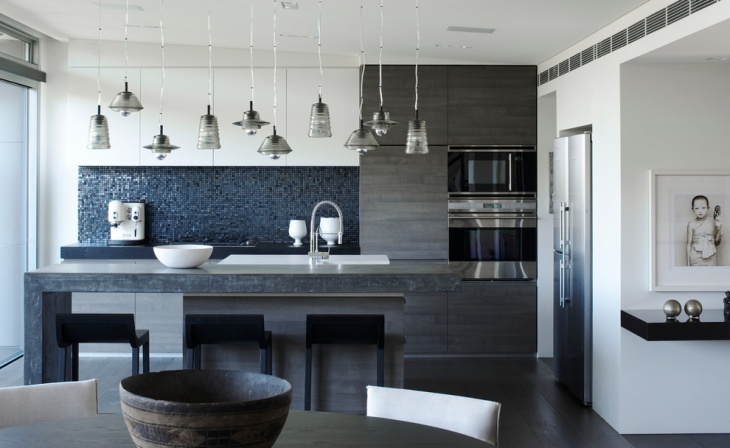 The gray shade used for this modern kitchen is dark enough to blend perfectly with the black and white combo. 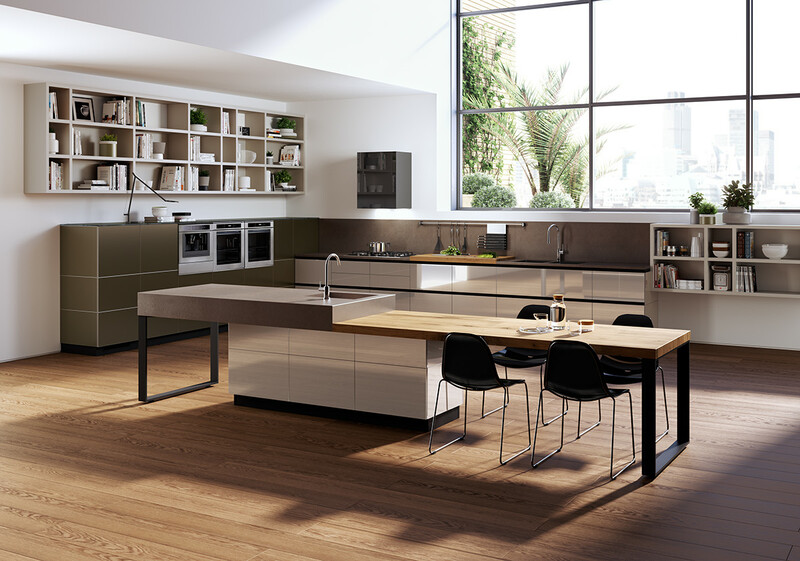 This is a contemporary kitchen design with the island used for preparation and cooking. The attached breakfast bar is an interedting addition. 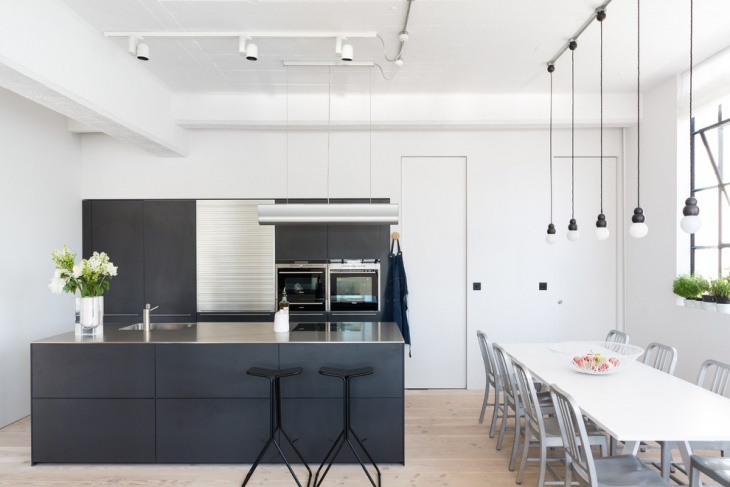 This kitchen extends to a dining space has a monochrome theme with white background (ceiling, floor, wall and pendant lights) and black accents (island cabinets and stool seats). The brown dining chairs provide a nice and neutral contrast. 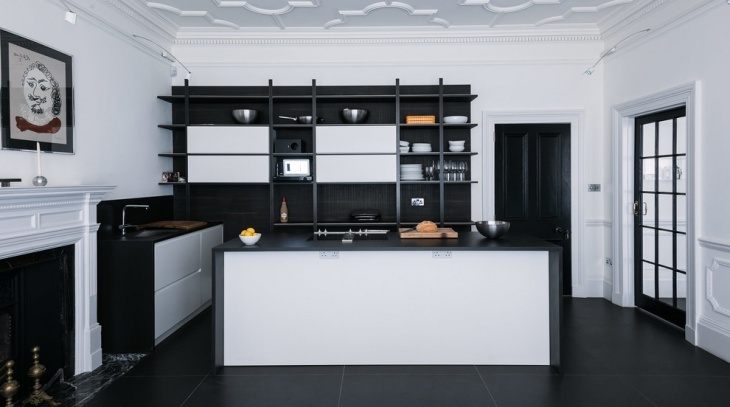 The perfect monochrome kitchen has a minimalist design, like this one. The division of the room is ideally set with the perfect allocation of black and white. 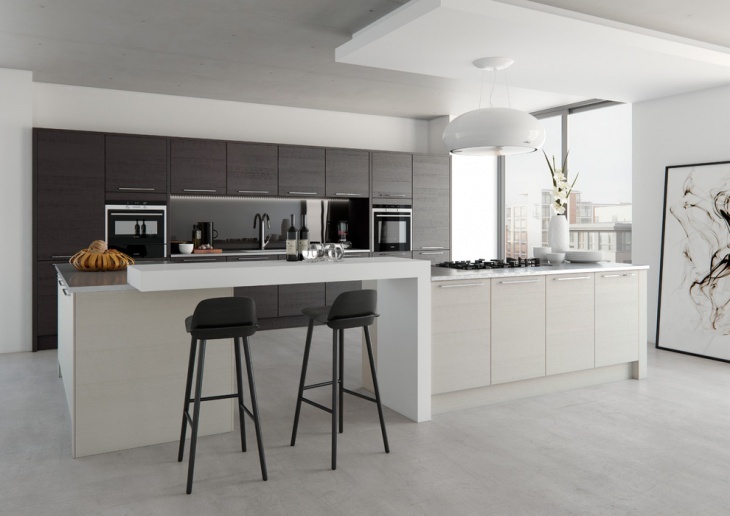 The small breakfast island in neutral light brown matches the wood in the cabinets. 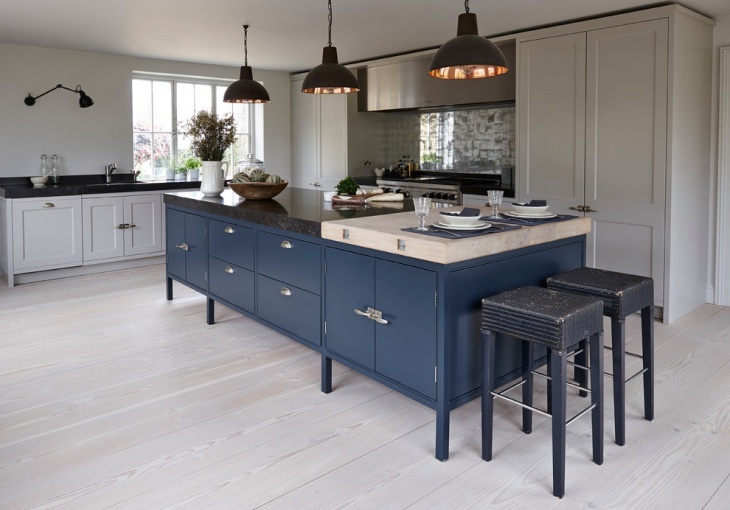 Light grey is used as the main color for this kitchen and to add color, a dark shade of blue is used for the island cabinet with matching rustic stools. 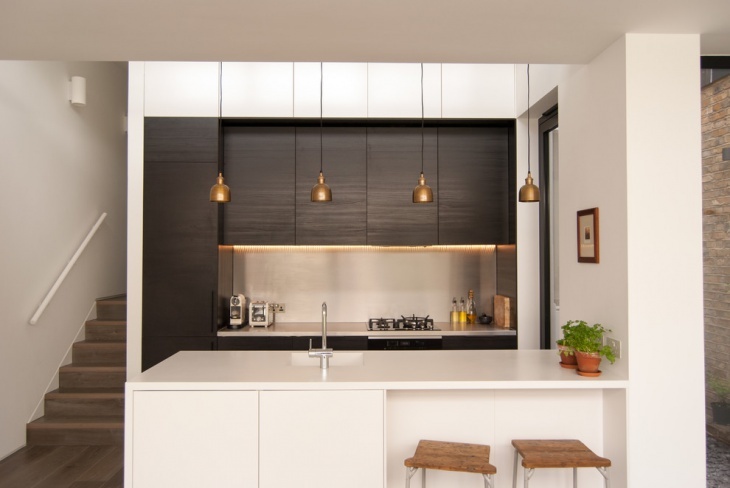 The black sink countertop and pendant lights act as the darker features. 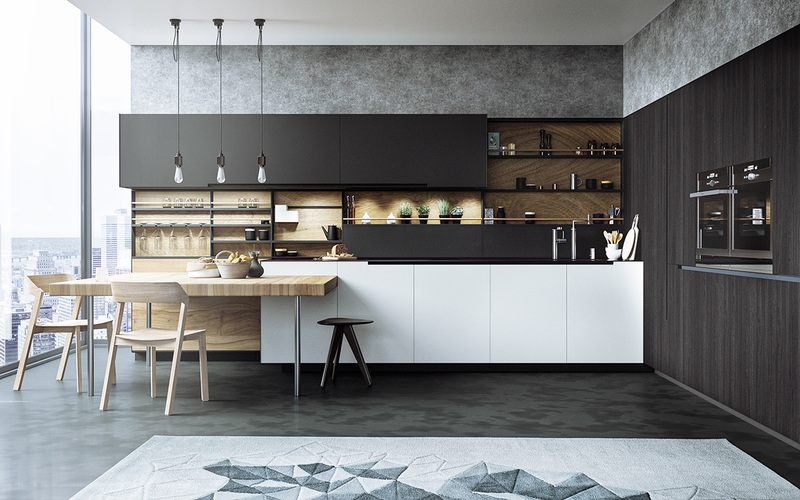 You can create a nice monochrome kitchen even with a small space. 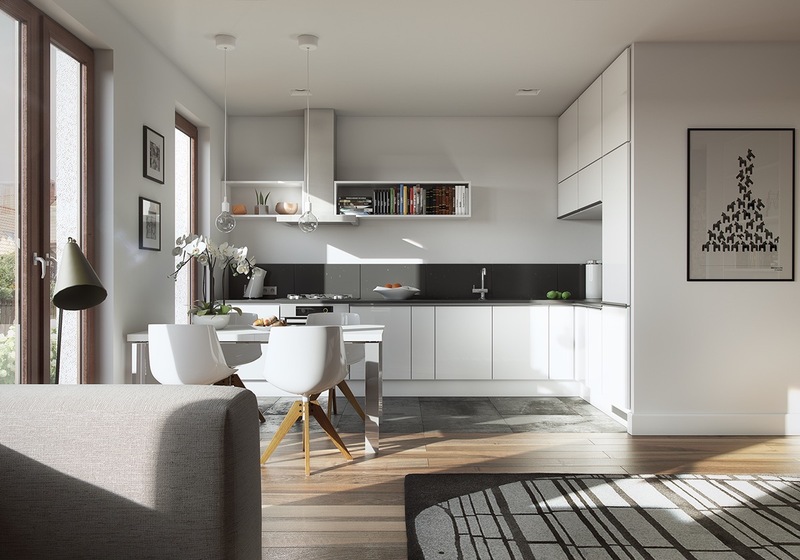 This tiny kitchen design, for instance, only has a single cooking (white countertop) and black cabinet set. The sink is installed in the white island that also acts as a breakfast bar. 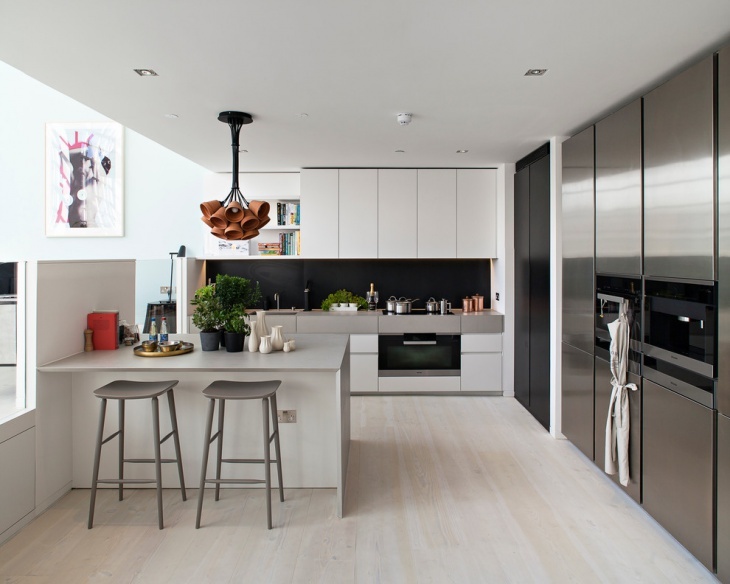 This kitchen stayed away from the traditional black and white monochrome theme. The focus of the design is in using the natural yellow/brown beauty of wood. 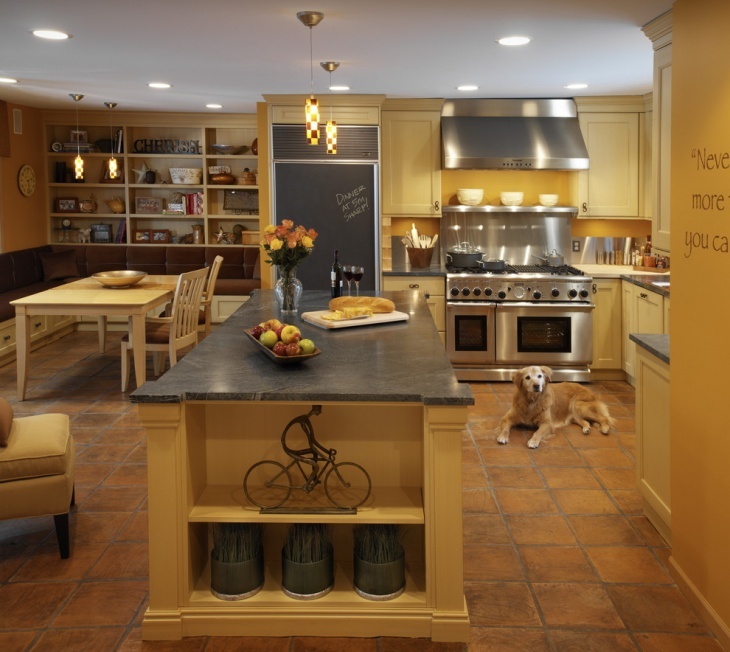 This scheme is matched by the brown terra cotta tile and contrasted by the stainless steel range, black chalkboard refrigerator and black granite island top. 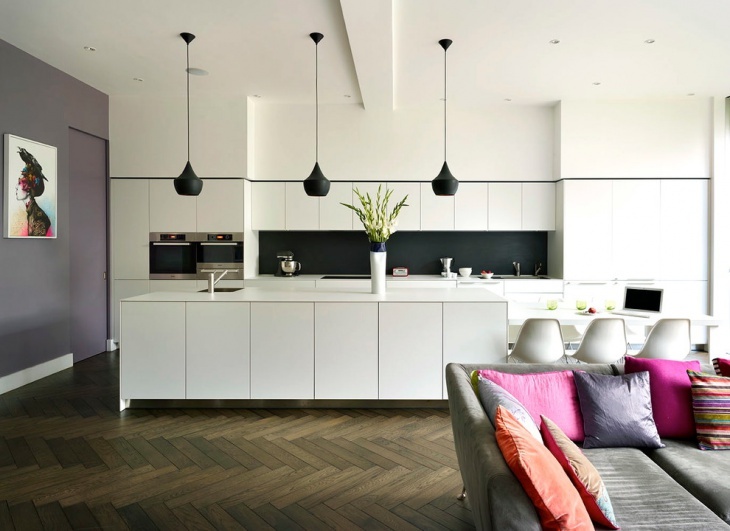 The monochrome design used for this kitchen is a nice example of creating a nice contrast between a white ceiling and a black flooring. 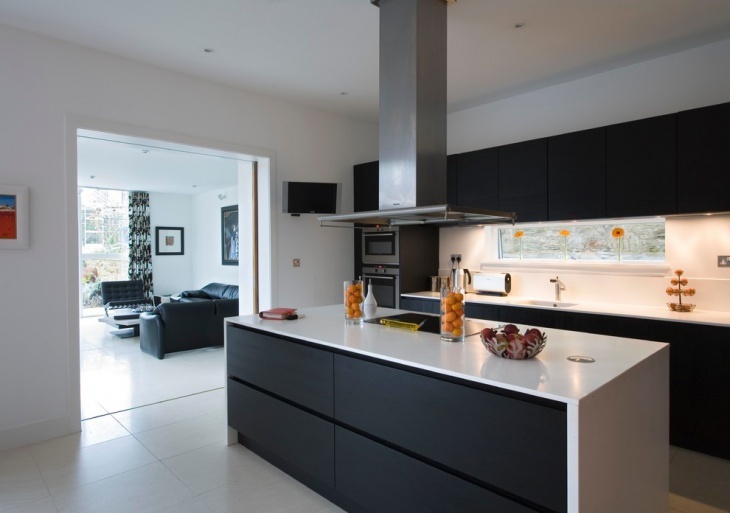 The perfectly executed black splashback is simple and catching, providing the room a nice point of interest. In creating a monochrome theme, it is important to consider that bright colors are not used as the main motifs. Basically, black and white combination is the perfect option. White is mainly and mostly used as the background shade for the ceilings, walls and floors. 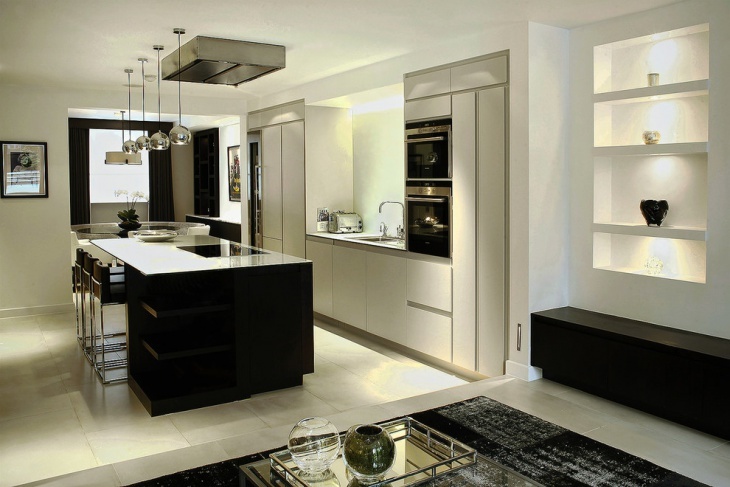 Black is ideally used for cabinetry sets, kitchen countertops, and sometimes on the flooring too. If you want to be a bit daring, you can use both black and white for the walls. You can also add some dashes of different colors like blue, gray, green, yellow and brown.